The staff members at Cambridge Village of Apex were very friendly. They had a lot of activities and there were lots of people in the lobby. They were willing to talk and interact with you. The location was great for us. We looked at the 2-bedroom and 2-bathroom with a den, it had a full kitchen, and the room-size seemed to be reasonable and well laid out. We ate there and the food was really good. The place is brand-new and looked great. 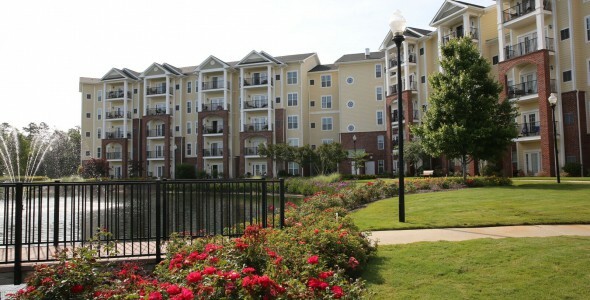 My mom moved into Cambridge Village of Apex. We're very pleased with it. She has to push a button every morning to make sure she's OK, and if not, they come in and check on her. Once a week, they vacuum for her, change her sheets, and that type of thing. Her apartment is very nice. It's not huge, but it's perfect for her. She went to some activities the other night. The staff has been excellent and wonderful, and they have helped her tremendously there. They have a very small but adequate library. They take trips during the day and you can go on the bus and they take you to the library. The best way to get to know a community is by scheduling a tour. See the facilities, meet the staff and residents, and get a feel first hand what it's like to live at Cambridge Village of Apex Independent Living. When it comes to building senior communities in North Carolina, communities for an independent and active lifestyle, you're the first thing on our minds. We understand that a new window of opportunity stands before you. The kids are blazing their way through their career; and the house, unfortunately, has become a hindrance. It is time to take advantage of the freedom that you can experience, without the daily responsibilities that keep you from experiencing everything that retirement has to offer. Cambridge Village independent living offers the freedom to explore new activities and hobbies. Freedom to focus on those things that are truly important. The freedom to experience a healthy and active retirement in one of the most beautiful retirement communities the Raleigh, North Carolina area has to offer.